History offers lessons on how low rates – and equity market valuations – might affect returns. The world has been living with low interest rates for eight years but such periods are not new. 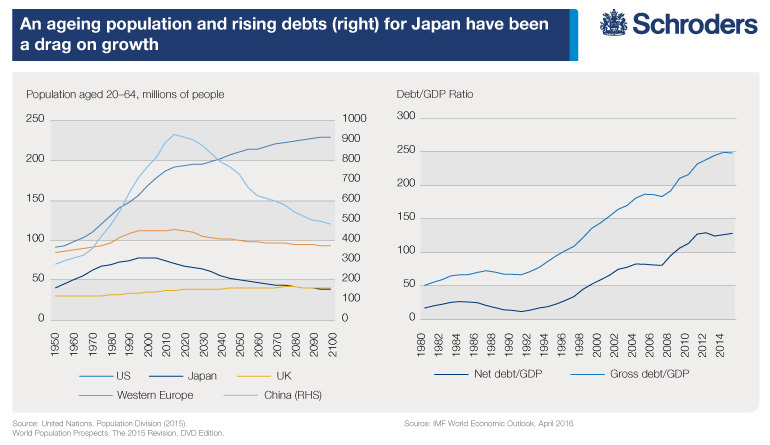 Both the US and UK saw rates below 1% for most of the two decades spanning the Second World War, while Japan has been living with sub-1% rates since 1995. Stockmarkets performed very differently in each case, with an exceptionally strong performance in the US but a more lacklustre showing in the UK and barely positive returns in Japan. Although performance was very different, this research argues that the lessons from all three were remarkably similar. The valuations of equity markets probably remains the most important determinant of performance, but company profits also need to grow. Whether they do is linked to a host of factors, not least government finances and fiscal policy, demographics, the health of the banking sector and inflation. And of course, the past performance of markets before is no guide to future returns. US equities delivered an annualised return of 11.6% between 1933 and 1950, or 7.6% a year in real terms – once inflation is taken into account. This was an 18-year period when short-term US interest rates averaged less than 0.5%. It coincided with the end of the Great Depression, the recession of 1937 and the Second World War and its aftermath. Stockmarkets were cheap following the Wall Street crash. One measure of value is CAPE or cyclically-adjusted price-to-earnings ratio. Profits are compared with prices, as with the usual price-to-earnings ratio, but with the earnings, after inflation, recorded over a decade and averaged out. This helps to smooth out possible distortions from economic cycles. Between September 1929 and June 1932, US equities fell by almost 85%. 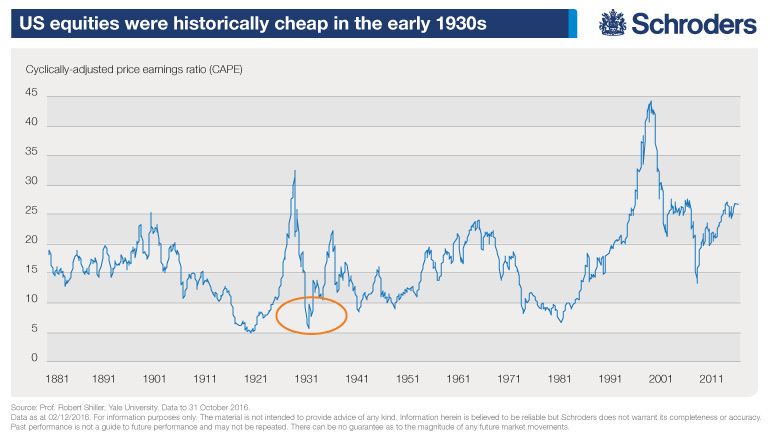 It left CAPE by the end of 1932, at 8.3, well below its historic average of 14.9 (see the chart below). At 7.2%, the dividend yield was also very attractive. Valuations today suggest the market is expensive. Economic growth was also very strong with GDP after inflation growing at an annual average rate of 5.8% between 1933 and 1950. Government spending grew at 6.5% a year above inflation. This was possible due to a low and rising level of government debt – at only 16.5% of GDP in 1930. The ratio peaked at 106% in 1946 before falling to 79% by 1950. With today’s ratio already around the 1950 level (see the chart below), there would appear to be far less capacity for an escalation in government spending. However, with monetary policy becoming less effective, the clamour for such spending is growing. Another factor to consider is that company profits when compared to the size of the economy were historically low in America in 1932. From this low point, profits after inflation grew by an average 7.4% a year between 1933 and 1950. By contrast, profit margins today are at historically high levels with far less room for improvement. To summarise, the US market currently scores poorly on every single indicator that supported equites between 1933 and 1950. More challenging times are likely to lie ahead. In the UK, the average short-term interest rates were 0.7%, only slightly higher than in the US. However, UK equities generated annual returns of just 5.6%. With inflation factored in, returns were barely positive and well below the 7.6% a year average on the opposite side of the Atlantic. Why was there such a divergence? The fall in UK shares between 1929 and 1932 was more modest than in the US. As a result, the US market was noticeably cheaper than the UK by the end of 1932. The UK dividend yield was 4.5%, slightly below its historic average. The US also outperformed in the 1940s, when any rebound was arguably over. Fundamentally, this difference in returns comes down to the UK’s poor relative economic performance during and after the war. GDP, after inflation, grew at 10.9% a year between 1939 and 1945 in the US, but at only 2.4% a year in the UK. 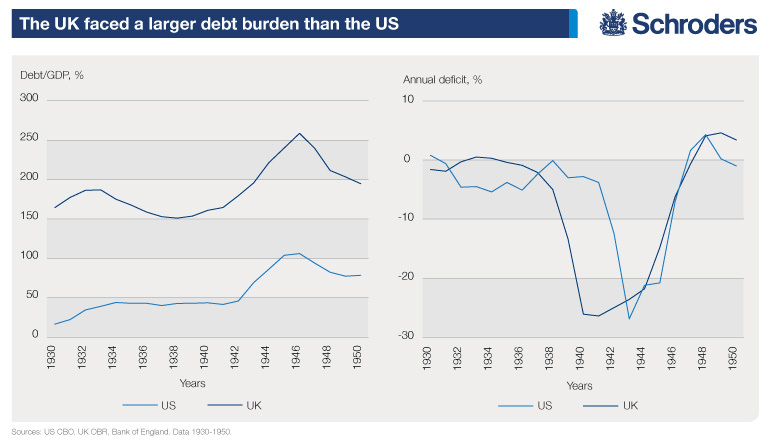 Two world wars had left the UK with a heavy debt burden, which allowed less room for manoeuvre (see the chart above). Japan’s episode of low rates, which still exists today, has been significantly different to the earlier experiences of the UK and US. Since rates were cut to 0.5% in September 1995, Japanese equities have returned only 1.2% a year. Even so, wide market fluctuations suggest there have been significant trading opportunities. The explanation for many of Japan’s woes lies in the bubble years of the 1980s. It burst at the end of the decade as the Bank of Japan, concerned by an overheating economy, raised rates rapidly, a policy soon reversed. Although valuations fell rapidly, they remained very expensive in a global context in September 1995. A combination of low interest rates and lack of will over the subsequent years meant bad debts were not recognised and there was little attempt to recapitalise banks. This led to the misallocation of capital, as healthier firms were starved of finance, and contributed to Japan’s declining productivity relative to the rest of the world. GDP in 2016 was no higher than its level in 1995. This has been exacerbated by Japan’s ageing population. The proportion of the population aged 65 and over has more than doubled since 1990 to 26%. Furthermore, the number of Japanese citizens aged between 20 and 64 has fallen by almost 10% since 2000, with another 10% decline projected over the next 15 years (Figure 4, left side). With fewer people in work, it is difficult for monetary or fiscal policy to raise economic output. By contrast only just over 5% of the US population was aged over 65 in 1930. The country’s economic problems have been compounded by persistent deflation. This has raised the real cost of borrowing and made it harder to pay down debts. It has also discouraged spending and investment, and seen wages fall. Government debts had climbed to nearly 250% of GDP by the end of 2015 (see the right-side chart above). In addition, Japanese firms have been perennially inefficient because of lower standard of corporate governance compared with global peers. More efficient firms offer better shareholder returns. There are signs that things are moving in the right direction. A corporate governance code has been established and the Bank of Japan and the Japanese Government Pension Investment Fund are diverting some equity investment towards companies that meet higher standards of governance. If sustained, these moves should underpin future gains in Japanese equities. Valuations remain important. The table below shows four different measures of valuation today. With CAPE and the p/e (price to earnings ratio), a lower figure represents better value. It is the same with the price-to-book ratio (p/b), which compares share prices with the total value of a company’s assets as stated on the balance sheet. Dividend yield is the income an investor can expect from a stock – a higher figure may suggest better value. 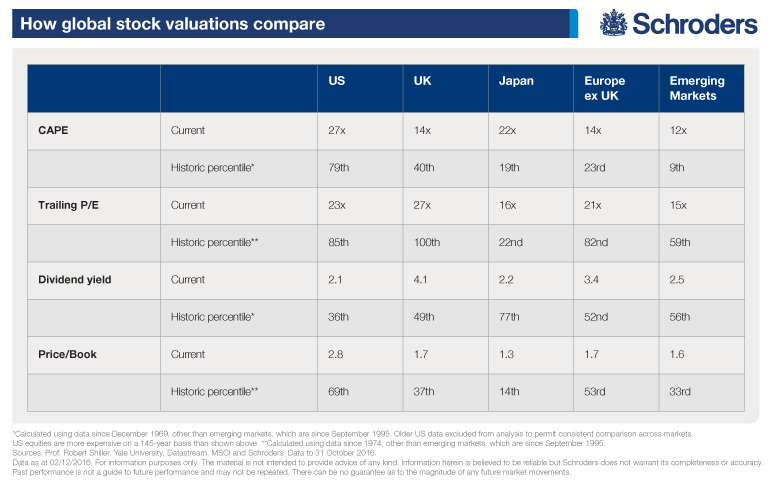 The table also shows how valuations today compare with historic averages. The historic percentile for the US CAPE measure at 79 suggests the market has been cheaper than it is today at 79% of the time. It’s not just CAPE that shows the US market may be expensive. It also registers a high price-to-earnings ratio and price-to-book ratio compared with historic norms. However, this valuation could be viewed as justified to some extent: the US economy is in better shape than much of the developed world, the banking sector is in reasonable health, core inflation has been running above 2% and the country has better demographics than elsewhere. In contrast, European growth is weak, its demographics are deteriorating rapidly and the financial sector has not sufficiently reduced borrowing. Many countries are suffering under high debt burdens and much of the region has either been in deflation or has been flirting with it. Japanese equities look reasonable relative to their own history, but less so against other markets. And Japan’s modest price-to-book rating is a result of the structural problems discussed earlier. In contrast to Japan or Europe, UK demographics are in better shape, while the country’s banking sector is less troubled. However, the equity market is dominated by the commodity and financial services sectors, both of which are expected to face structural weakness. A cheap rating on a CAPE basis may be misleading if earnings do turn out to be as low as expected on average over the next economic cycle. Emerging market equities look cheap, benefit from favourable demographics, healthier government finances, positive inflation and an untroubled banking sector. On the other hand, growth is expected to remain lower than before and the build-up in Chinese debt is concerning. As we are all painfully aware by now, credit bubbles do not normally end well, so this is worrying not just for emerging markets but also the developed world. Very long periods of very low rates are not a new phenomenon and can result in wildly different outcomes for equity investors as the US, UK and Japanese experiences demonstrate. Long-term returns may be poor when valuations are high, unless company profits grow very quickly. Government finances and fiscal policy, demographics, the health of the banking sector and inflation all demand our attention. No one market stands out as being particularly attractive in these terms. If global economic growth stabilises or improves, then emerging markets and Japan look best placed, while the highly-rated US market may struggle. However, if global growth slows, both emerging markets and Japan, along with Europe, could come under renewed pressure and the US is likely to prove more resilient. Investors need to be flexible and ready to seek investment opportunities where evidence of innovation and growth is strongest. Finally, although volatility is often viewed in negative terms, investors should also take some comfort in the bumpy ride that Japanese equities have experienced over the past two decades. These conditions, if repeated in this or other markets, should allow skilful investors to add value though timely allocations. The above article by Duncan Lamont, Head of Research and Analytics at Schroders, was first published by Schroders on 5th December 2016. Previous Previous post: Europe: political events in Italy prelude to the eurozone’s demise?